On Remembrance Sunday, 13th November, there will be a short worship service including the Act of Remembrance led by the Salvation Army at the War Memorial in Cumbernauld Village at 10.45am. The morning worship service in the Parish Church will then follow at 11.15am, instead of our usual 10.15am start-time. Remembrance Sunday worship at the Forge in Balloch will take place at the usual time of 11.45am and include a two-minute silence at noon. As the Forge Community Centre, Balloch will be closed for essential maintenance at the beginning of August, there will be just one service at Cumbernauld Old on Sundays 2, 9 and 16 August. This will be held in the Parish Church in Cumbernauld Village at the revised time of 11.00am. Transport will be available from Balloch for anyone who requires it. All being well, we’ll revert to our usual two services at 10.15am in the Parish Church and 11.45am in the Forge Centre from Sunday 23rd August onwards. The next Cumbernauld Points North Messy Church will be on Sunday 8th February, i.e. this coming Sunday, when we’ll be looking at the theme of ‘friendship’. There will be lots of crafts and activities linked to that theme, and we’ll hear about the Bible story of a group of people who wanted to help their sick friend so much that they climbed up onto the roof of a house and lowered him down to the room where Jesus was so he could heal him! After a time for games we’ll sit down to share a meal together. The fun starts at the Forge Community Centre, Balloch, G68 9ND at 3pm and we’ll finish around 5pm. All welcome! The first Points North Messy Church of 2014 takes place next Sunday 12th January in the Forge Community Centre, Balloch. We have a new start-time of 3pm and will aim to finish around 5pm. We’re starting off the year by looking at some people and stories from the Bible – January’s theme will be ‘Noah’ so expect some animal-themed crafts and songs, and perhaps even a wee surprise with our food near the end of the afternoon. So please come along next Sunday – you don’t have to come in two-by-two! – and remember our earlier start-time of 3pm. Hope to see you there! 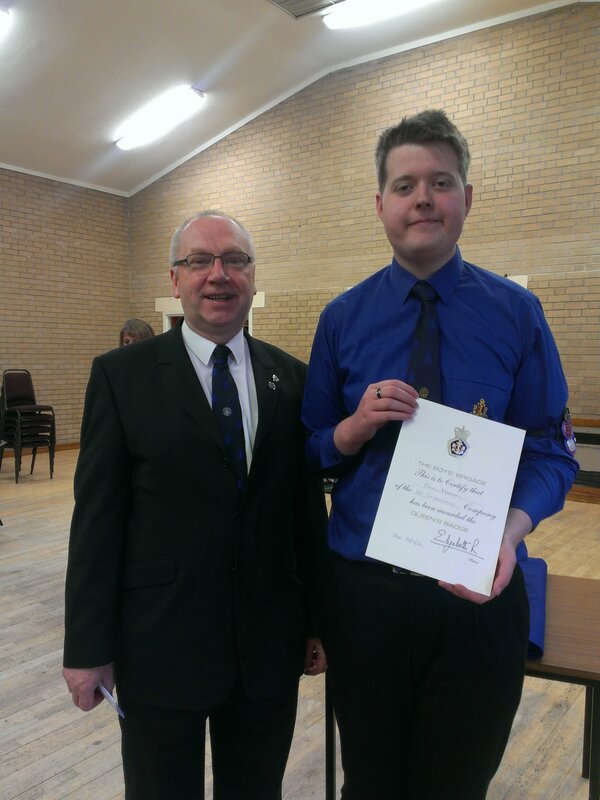 Many congratulations to Ewan Marshall of the 1st Cumbernauld Boys’ Brigade Company, who was presented with his Queen’s Badge at the Company’s dedication service in church on Sunday 27th October. In the photo on the right Ewan is pictured with Alex Edwardson, the Company Captain. The Queen’s Badge is the highest award in the Boys’ Brigade and is awarded only to those young men who have achieved a high standard across a range of disciplines over a number of years. So, well done again, Ewan!